Definition - an arboretum is a place, a plot of land, where many different trees and shrubs are grown for both scientific study and educational purposes. Today the Tohickon Garden Club is making a field trip to the Morris Arboretum of the University of Pennsylvania, in Philadelphia. Begun in 1887 as the estate of John and Lydia Morris, brother and sister, who purchased and landscaped much of the arboretum's current site. We gather at the Widener Visitors Center where our group is divided in two. 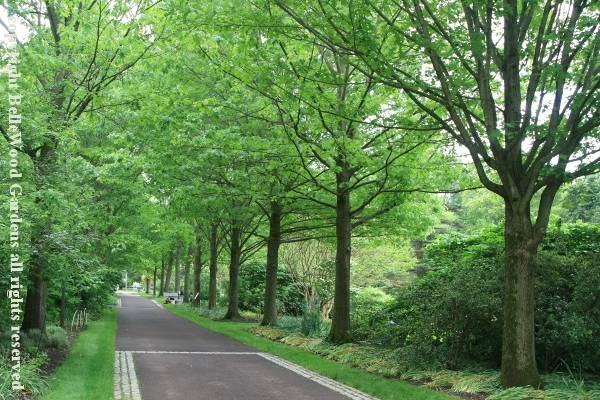 Each group has a guide, familiar with the arboretum, its history, and its plants, setting off on a brisk walk that will provide us with some highlights and encourage a return visit to see what was not included today. After all, we only have 75 minutes for our tour. The historic collection traces its beginning to John Morris's interest in plants from around the world. Early 20th century is when E.H. Wilson of the Arnold Arboretum was collecting in China. Propagating material from these turn-of-the-century expeditions was shared with other arboreta and gardens, and dedicated amateurs such as John Morris. 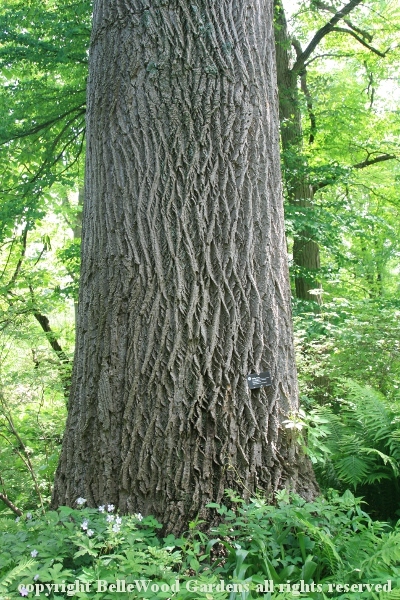 Today, many of the Delaware Valley's "trees-of-record" (the largest of their kind) are found growing here in the Arboretum. It is wonderful to see these trees, more than a century old and so much larger than can be accommodated in today's more modest gardens. 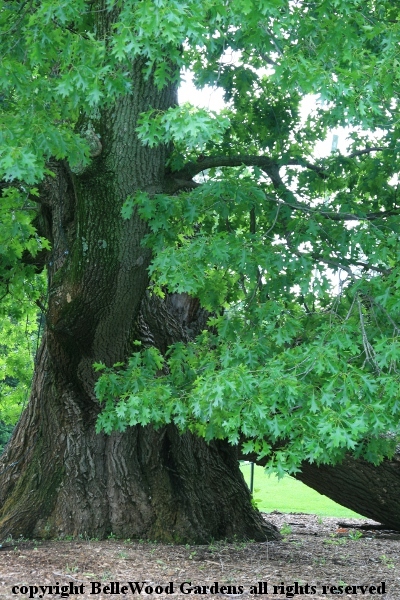 One such is the Bender oak, Quercus ×benderi, a natural hybrid between red oak, Q. rubra and scarlet oak, Q. coccinea. 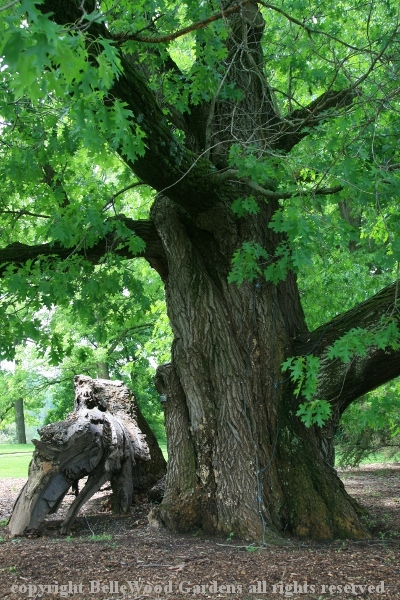 Located between the parking lot and the Widener Education Center, this ancient among trees is thought to be 250 years old. 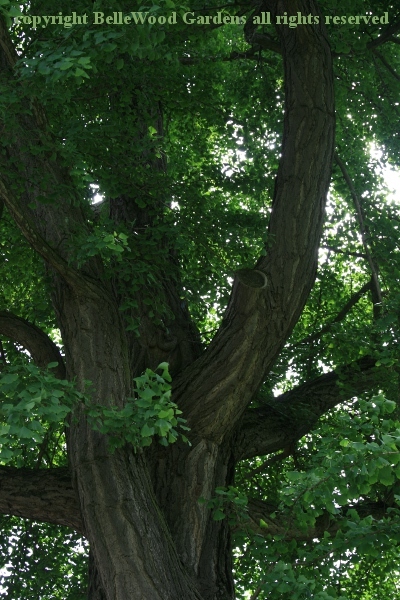 Towering 87 feet tall, its canopy spreads over 100 feet across on a trunk with a girth of 22 feet. Maintenance for veteran trees such as this is different from what might be done in a home garden. Steel cables are a supplemental system to help support the massive limbs. Larger limbs may be cut back, both to reduce weight and to encourage growth back towards the trunk. But this is not pollarding, where trees are cut back to a stump, new shoots grow and are, in turn, cut back. The result is a bushy looking tree with a mound-like appearance, a good way to produce firewood and wood for charcoal making. Even with this attentive care, the winter storms of 2014 / 15 brought significant damage to the Bender oak. The decision was made to leave things as a teaching moment. By the way - that thin bluish line you can see at the center of the trunk? It is a copper conductor lightening rod. After all, this is the tallest tree around this spot and it's on top of a hill. Grounded some 10 feet deep into the soil, the cables safely carry an electric charge down into the ground where the energy is dissipated. Nearby is a huge ginkgo, planted by the Morris siblings. Individual trees in this genus are either male or female. This one is a female, littering the ground in autumn with attractive, edible seeded, messy, very stinky fruit that smells like vomit. I glance down, and notice that the ground is so thick with seeds that it looks as if it has been mulched with them, and some of which are germinating. As we continue our tour we come to weeping European beech trees promenading down a hill. Apparently as their branches sweep down to the ground some rooted at the tips, making another tree here and there. 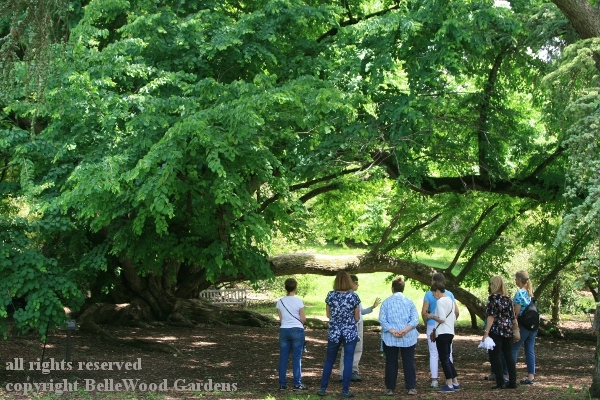 Some garden club members gather under a huge katsura tree, Cercidiphyllum japonicum, that was planted by the Morrises around 1902 as part of their Japanese garden. It is not merely a Delaware Valley tree-of-record. 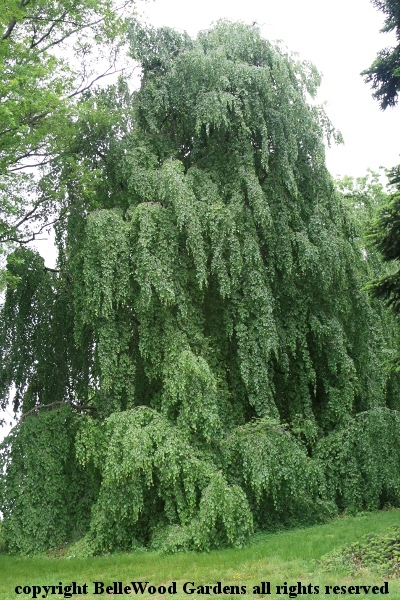 At approximately 72 feet by 100 feet by 71/2 feet diameter this katsura is the United States champion tree. 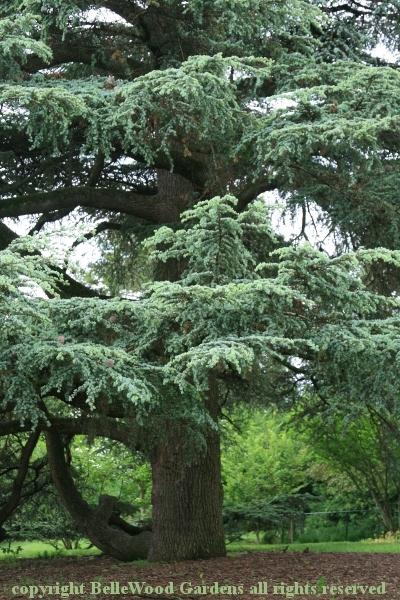 Onward, to admire a blue Atlas cedar,Cedrus libani ssp. atlantica 'Glauca', native to the Atlas Mountains of North Africa and is one of the arboretum's few representatives from that continent. Unlike more familiar conifers (pines, spruce, firs and such) whose cones dangle from their branches the fat cones of the Atlas cedar stand upright, looking sort of like old fashioned bee skeps. Planted sometime between 1910 and 1920, it arrived as a seeding from the Arnold Arboretum, raised from seed that arboretum received in 1902. Was it our guide who mentions that the silvery blue color of its needles make an especially good contrast for fall color in this part of the arboretum? I'll have to come back to see for myself. Just gaze at the trunk of this tulip poplar, Liriodendron tulipifera. It clearly has grown to a stately size, even if it is not one of the trees of record. A wonderful, unusual magnolia. 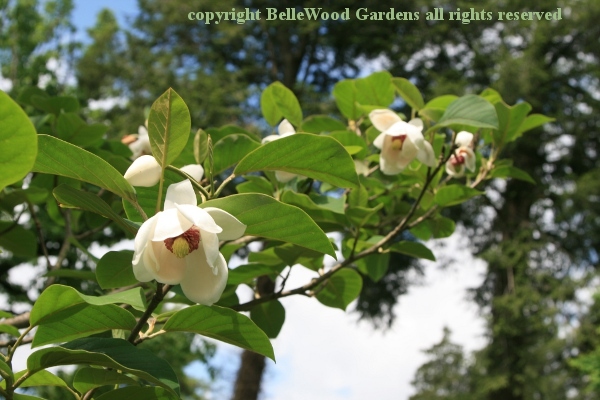 The only other place I've ever seen Magnolia sieboldii with its nodding flowers was at an estate in Ireland. Modest in size (perhaps 30 feet tall) with multiple stems this surely is one to consider for a home garden. 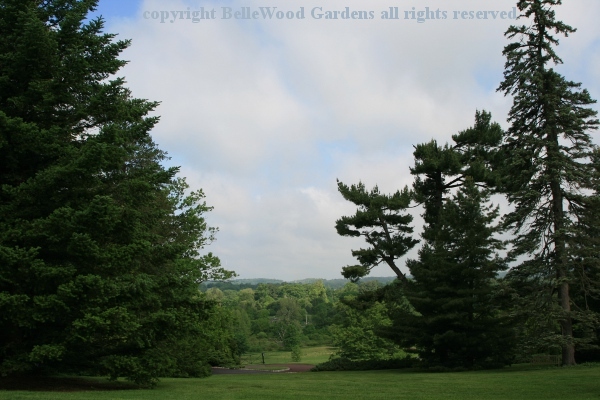 Morris Arboretum is not only about ancient trees. They are planting new trees, and also dealing with the effects not just of of time but also weather. Remember the Bender oak and its major collapse with which this entry began? Here is the oak allée as it is today. These scarlet oaks, Quercus coccinea, were planted after a devastating storm in 1991 caused extensive damage to those planted by John and Lydia Morris. Mere youngsters, they provide an intimation of how grand the allée will look when they mature. Visit in spring, in summer, in autumn or winter. Come now, come in a century. The arboretum will be here with wonderful trees and gardens to enjoy.